Maps for Adobe CC v1.3.2 is live! - Introduced with Illustrator v23.0.1 on Mac OS, the extensions drop downs and control labels do not display correctly. - Projection of shapefiles did not function as expected. Quick update. We have had some reports of an issue randomly occurring on a few user machines after upgrading to v1.3.0 of the extension. When this occurs the Mapboard and Compilation panels remain blank and don’t display any controls or the map. It could occur with either Illustrator or Photoshop on both Mac and PC’s. We have narrowed down the source of this issue to the given apps ‘Preferences’. We already have a fix for this which will be posted in the next update. In the meanwhile, to continue working with the extension if you encounter this, we suggest to manually restore the preferences on the app that the issue appears on. Following links describe steps to restore preferences in related apps. We apologize for any inconvenience this may have caused and thank you for your patience while we roll out the update. If you continue to see an issue with the display of panels after restoring preferences please contact mapsforadobe@esri.com and we will be happy to work with you to investigate further. The new 1.3.1 release of ArcGIS Maps for Adobe Creative Cloud is now up on the Adobe Exchange. If you have a previous version of the extension installed, it should automatically update to 1.3.1 the next time you login to any of the Adobe Creative Cloud apps or your account. 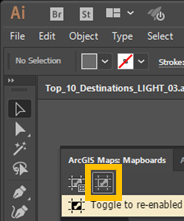 If you've not installed the extension before, go to the ArcGIS Maps for Adobe Creative Cloud listing, and click the blue "Free" button in the upper right. My colleagues Nick Brueggemann and Gregory Brunner made a map of the NCAA Tournament rosters showing where the bracket athletes' hometowns are. The data comes from this sports website's NCAA Roster information, where they list the athletes' positions, class, hometown, and other statistics. I asked Nick and Greg if they'd share the geodatabase they created. From that database, I made some handy shapefiles, and was able to add those shapefiles from my local drive to the ArcGIS Maps for Adobe® Creative Cloud® app (M4CC) inside of adobe illustrator. To make these maps, I drew my mapboard at the full global extent, and then added the Women's roster shapefile and Men's roster shapefile using the Compilation window. For information on how to add data to the m4cc Compilation window, check out this useful page. The M4CC app allows you to access ArcGIS Online' s smartmapping tools directly while inside of Adobe Illustrator. I was able to use the graduated symbology to size the athletes' hometown points by the amount of players that come from there. Here's a previous post I wrote showing how to access the Smart Mapping tools using M4CC. To calculate the distance between each player's hometown and their team's city, I used a handy map math formula in Microsoft Excel. From there, I was able to create bar charts inside of Adobe Illustrator. It's interesting to see how far some athletes have relocated! For more posts and updates on Maps for Creative Cloud, you can follow them here. Having install issues, the Adobe Exchange site has instructions if the auto-install from the website doesn't work. They list three tools you could use. Our experience, and feedback from a number of users is Anastasiy's Extension Manager works most successfully. When downloaded, the file name is ArcGIS®_Maps_for_Adobe®_Creative_Cloud®_1.2.0.zxp. It maybe require to renamed/removed the "®" characters to ensure a successful install. Note that you may need IT support as Anastasiy's Extension Manager requires an administrator password to be installed. In this blog post, you'll read about how to create a choropleth map of Minnesota population density using the ArcGIS Maps for Adobe Creative Cloud extension that we are building at Esri. Last month I had a wonderful time presenting cartography to graphic designers as a guest for three sessions of Adobe Live at Adobe's headquarters in San Francisco. During these live-streams, artists design bits of - or complete - projects, and discuss their process while they design. An audience of creatives viewing the livestream can live chat with the artists as they design. Although I already knew that a lot of today's designers are making maps for their clients, it is always a totally elucidative experience talking about mapping with designers, most of whom have not been formally trained in cartography or GIS. In fact, it's quite humbling. Designers come to mapping with totally fresh eyes that are not weighted down by staying within a box of cartographic rules. The results are stunning. I am always so grateful for these reminders to bend the rules and continue to discover. Here's the process to make one of the maps I built during an Adobe Live session. It's a choropleth map made with ArcGIS Maps for Adobe Creative Cloud via Illustrator. This is a great exercise for graphic designers who are looking to explore cartography and dataviz a bit more. 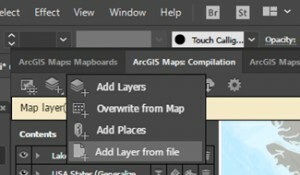 TIP - If you don't have it already, you'll need to install ArcGIS Maps for Adobe CC (M4CC) from Adobe Exchange. Once you have opened Illustrator and logged into the M4CC extension, zoom to your desired extent, and draw your Mapboard. To do this, click on the Mapboard tool in the upper-left of the Mapboards tab, and draw a box around the area you want to map. For this map, I'm making a choropleth map of population density in Minnesota. Really quick, a choropleth map uses color saturation and/or hue to indicate a statistic's value or intensity within usually-adjacent polygons - or as some non-mappers might call them - color-coded maps. Once you've drawn your mapboard over the extent that you want to map, you'll be prompted to give your mapboard a name in the Mapboard Options dialog. You'll also be able to specify your map's size here. I've named mine "MinnesotaPopulationDensity" and I left the scale and size as they were. TIP - Whatever you name your mapboard will also be the name of your downloaded Illustrator file. If your mapboard name is identical to an AI file in the same file location where you will download your map, then you will be prompted to give your mapboard a new name. Go to the M4CC Compilation window. This might be hiding underneath your Mapboards window. In the image above, I've docked the Compilation and Processes windows together with my Mapboards window. When you get to the Compliation Window, you'll see a preview of your map. The current version of the M4CC extension uses a raster basemap for reference. You can zoom to make this preview larger, but note that the raster basemap, and any raster data that you add to this map will be a bit blurry in the preview if you do. To zoom back out, just press the Alt key while zooming. There are a few different ways of adding data, and a few different data types you can add. 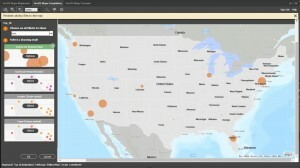 For this demo, I'm going to add the "USA Counties" map layer that is available on ArcGIS Online. This is all made possible because this extension leverages the "Cloud" part of the Adobe Creative Cloud, and therefore allows you to access ArcGIS Online within Adobe Illustrator and Photoshop. Click the Search and Add Content button, and select Add Layers from the menu. This will bring up the Add Layers dialog. In the Add Layers dialog choose "ArcGIS Online" from the Browse Location dropdown, and type "USA Counties" in the search box next to it. You can also filter to "Show Vector Layers" from the data type dropdown beneath the search box. Then click on the plus ("+") icon in the "USA Counties (Generalized)" layer from the list of data layers that appear. This will add the layer to your map. Note - You may need to scroll a little to get to this layer. You could sync/download this map now, and make a map with just the counties. However, let's add some reference spatial data to this map. We'll start with state boundaries. Performing the same steps as above, click the Search and Add Content button, and select "Add Layers" from the menu. This time type "USA States" in the search box, and scroll until you see "USA States (Generalized)." Click the plus ("+") icon, adding this layer to your map. The Great Lakes are a huge part of the spatial identity for much of the Upper Midwest. There is a good reason for this: the Great Lakes region is magnificently beautiful. Even though this map is not about lakes, we can add Lake Superior to this map in a sleek way so that it doesn't distract from the map's population density theme. In fact, adding Lake Superior and the states as map data with a low visual hierarchy will give a nice spatial reference for people who may not be familiar with the exact geography of Minnesota. In other words, let's not have a map where Minnesota is a floating island if we don't have to. Performing the same steps that you did to add the counties and states, search for "Lakes_World" and add the "Lakes_World_Robinson" layer. This is a layer hosted by Esri's GeoInquiries™ for schools, which is a great GIS education resource. 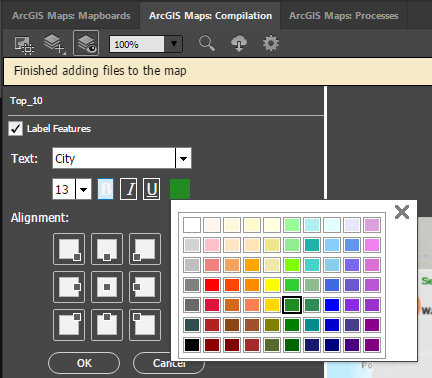 Since the map you are building in the Compilation Window is essentially being built in the ArcGIS Online environment, you have access to a lot of ArcGIS Online styling tools. Instead of raving about how amazing it is that you can access ArcGIS Online map data and leverage the fantastic ArcGIS Online geo-dataviz styling tools inside of Illustrator I'll move on. (Seriously, though. ArcGIS Online map styling is really great). Click on the Change Style painter's palette icon in the "USA Counties (Generalized)" layer. This will bring up ArcGIS styling tools. From the Choose an attribute to show dropdown menu, choose the top "Pop. per Sq. Mi." from the list as this is the most current population data for this layer. These values from which you're choosing are U.S. Census data attributes for each of the USA counties. From the Choose an attribute to show dropdown menu, choose the bottom "Pop. per Sq. Mi." Now, you get to choose a drawing style. Among the four choices you're provided, Counts and Amounts (Color) and Counts and Amounts (Size) make the most sense for a population density map. Since we're making a choropleth, choose Counts and Amounts (Color) by clicking the Options button. This will bring up some dataviz decision tools. If you're comfortable with dataviz, then feel free to style the data as you wish. For the purpose of this demo, here are some useful instructions on updating the dataviz for this choropleth. Change the Class Breaks number to "6" by either typing the number in the box, or clicking the up arrow once. *IMPORTANT* The choropleth in the Compilation window is created from all USA counties, the most densely populated being nearly 70 thousand people per square mile. Minnesota's most dense county is Ramsey County, at just above 3 thousand people per square mile. For this reason, this demo will have all values above 3,000 in the highest category in the Compilation window. This will be addressed in the downloaded AI file. Because a lot of Minnesota's counties are really sparsely populated, the first category will be 1-10 people per square mile. To do this, very carefully click on the bottom value in the Change Symbol Style dials and in the entry box type "10" just like the image below. TIP - If you would like to update the colors of the choropleth, you can choose among several gorgeous ArcGIS Online color palettes by clicking Change Symbol Style. For this map, make sure you are choosing a sequential (a sequence of light-to-dark) color scheme and that the lighter color represents the category with the smallest values. Now you should have tiny labels in each of the Minnesota counties, a choropleth that indicates counties' population density, part of Lake Superior, and a USA States layer. This means that you're ready to download the map into Illustrator and start designing! Style Your ArcGIS-created Map in Illustrator! Delete all the counties outside of Minnesota since this is a Minnesota-specific map. 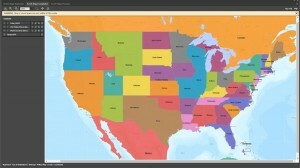 Remove the Fill color from your USA States (Generalized) layer. Also, make sure this layer is above your counties layer. Remove the basemap, and allow the area in Canada to be a space for your map's title. It's pretty cool that you get a scalebar, but it isn't necessary or advised for this type of map. Delete both of them. IMPORTANT - When building your legend, make sure the highest category is no higher than 4,000. Remember that the densest county in Minnesota only has 3,100 people per square mile. Of course, depending on your style your map will look slightly or even drastically different. Still, here's my finished map of Minnesota Population density. Happy mapping! We are expecting 1.2 to be available on March 5th...via the NEW Adobe Exchange. We are excited about the new Adobe marketplace, as it should resolve previous install issues that some users experienced with the existing Adobe Add-On site. There are many other enhancement features coming as well...you can see some of the details from Adobe on the new Exchange here. ArcGIS Maps for Adobe on AdobeLive! Tune in from Tuesday through Thursday (Jan. 9th-11th) each day at 3 p.m PST to see Sarah Bell present ArcGIS Maps for Adobe Creative Cloud on AdobeLive! The 3 recordings will be posted by Adobe to their YouTube channel, the links to these plus the Q&A from the events can be found below. Esri builds mapping and analytic software to answer location based questions (e.g. Site or store locations, managing utility (power, water) networks, land and resource management, and much more…) and communicates those answers visually through maps (static, web/interactive, 3D, etc.…). ArcGIS is Esri’s mapping and location analytics platform. ArcGIS is to Esri as Creative Cloud is to Adobe. It’s a collection of software and services. Check out the Maps We Love! All of the Maps We Love are all built with Esri technology by our users and/or Esri staff. The site highlights how the maps were made (technology products and steps) and why they are good example of effective cartography. 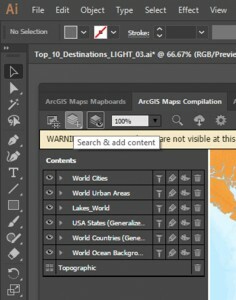 Where do I get ArcGIS Maps for Adobe Creative Cloud Extension? From the Ai or Ps menu, select Windows > Extensions > ArcGIS Maps for Adobe Creative Cloud. I’m having issues installing can you help? Sure! We have a great GeoNet community thread that outlines standard troubleshooting. If you’re still having issues, please feel free to post there and a member of the team ill be there to help. How do I sign-in to the ArcGIS Maps for Adobe Extension? For free by providing your email address and Esri will send you an activation code which allows you to access public/free data/artwork hosted on Esri’s cloud (ArcGIS Online). This public data is provided by users, partners, and Esri; of course, you can use your own local data as well. Using an ArcGIS Online account (a for-fee Esri account similar to an Adobe Creative Cloud account) which gives you access to more advanced features in the extension with richer data/artwork. What is the typical (“simplest”) process to make a map? Navigate (pan and zoom) to the location you want to make a map of, in the mapboard tab/window. Or you can type in a place name or address and have the extension pan and zoom you there. Then draw a box (we call it a mapboard) that defines the size of the map. The geographic extent as well as the output artboard size you want in Ai or Ps. Next, add map data (artwork layers) to your map inside the compilation tab/window. The extension comes with default base map layers (we call basemaps). You can pick from image maps or vector layer - we recommend our Vector Streets Map (this basemap is great for “zoomed in”/large scale mapping). Or you can add other content from Esri’s cloud (ArcGIS Online) or your own local data (csv, txt or shp files). Lastly, download (sync) your map into Ai/Ps and design just as you would normally work. Can you make maps of made up places (“fantasy maps”)? make your modifications and apply your design in Ai/Ps as a starting point, then even change the shape of places and add your own names. There is a map of Mars on the Maps We Love site (http://www.esri.com/products/maps-we-love) that outlines the steps on how that map was made. What are the map credits? They list the organizations/companies or people that provided the data used to make the map. It is good to give credit back to those organizations as the information provider. It’s encouraged, like in any report (e.g. school paper, presentations, web sites, etc. ), to list your references when you are restating/siting/re-purposing someone else’s work. How would an average creative (non-cartographer) use ArcGIS Maps for Adobe Creative Cloud? Where can I get more info on ArcGIS Maps for Adobe Creative Cloud and mapping? How to create a bar graph with text? 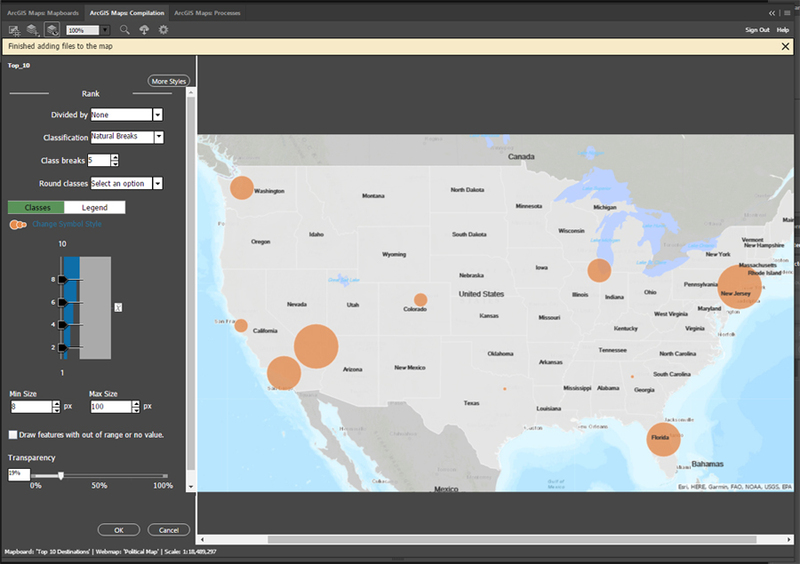 ArcGIS Pro is another software product Esri make that has the capability to do other types of data visualization graphs (e.g. bar graphs). You can export an SVG file out of ArcGIS Pro and place that into Ai, the bars and text are individual strokes, fills and text you can manipulate inside of Illustrator. 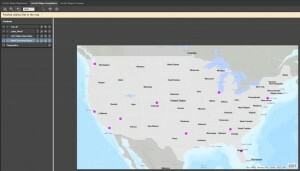 Can you bring in Google Maps data and add that to the other data from the ArcGIS Maps for Adobe extension? Today you can convert a KML (keyhole markup language) to a shapefile, and add that data (artwork layers) to your map inside the compilation tab/window. We are planning to support a direct add of KML files in our next release. How long has cartography been around? Cartography has been around for a very long time. Wikipedia has an excellent background and history page to explore. Has satellite imagery killed manual (vector) mapping? Satellite imagery is great and is a quick way to map a location. However, they don’t allow for stylizing, branding, or feature emphasis. Satellite imagery is image/raster based so there is a need or value for images in some workflows and vectors in others, just like Ai and Ps. Are there any “best practices” or typical Map (design) “rules”? Yes, there are design “rules” for making a map, and even college classes. Not unlike any specialized design field (e.g. color, type, website, UI, UX), there are conventions and best practices that the leaders in these fields highlight. The“Cartography.” book, highlights these with great visual examples and so does the Maps We Love web site. However, a map, like any design project, is a creative process, and rules are made to be broken sometimes for better more effective communication or to make something stand out from the norm. There’s an excellent website that outlines exactly what geocaching is. Check it out! Can you control the map projection in ArcGIS Maps for Adobe Creative Cloud? Yes, if you are logged in using your ArcGIS Online account you can set the projection using the settings button before you download/sync. Can you make interactive “zoomable” maps? ArcGIS Maps for Adobe extension is focused on making static image maps inside of Ai or Ps. There are other ArcGIS products that allow for the design and creation of interactive maps. At last month’s Adobe MAX 2017, I had the opportunity to present how easy it is to make data-driven maps in the new Version 1.1 of the ArcGIS Maps for Creative Cloud (M4CC) extension m4cc Creative Cloud Mapping.The audience was fantastic! One of the things I really appreciated about this audience was that the majority was made up of designers who did not come from a cartography background, yet they still were eager to integrate maps in their great design work. Their keen eye for design can produce spectacular looking maps. Below is Expedia’s list of the ten busiest Labor Day destinations, which can also be found in this article by PR Newswire. While this list is informative on its own, a map of these Top 10 cities could add some useful visual context for this article’s readers. Here is how I turned this list of cities into a “Top 10 Locations” map. The first quick step was to recreate this list of 10 cities in a program like Excel, and then save as a Comma Separated Value – or CSV – file. 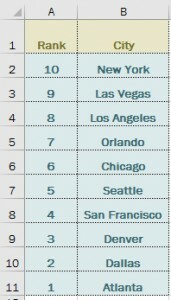 In the article, the list is ordered where 1 is the most visited city, and 10 is the 10th-most visited city. But since I wanted to put the cities as points on a map, and then make the city points’ sizes based upon some sort of rank column in the CSV file, I flipped this order as follows: Since New York city needs to be the biggest point, I’ve flipped the order of this Rank column, so that the most visited city has the highest rank, the second most visited city has the second highest rank, and so on. Then I saved the CSV file, and closed it. 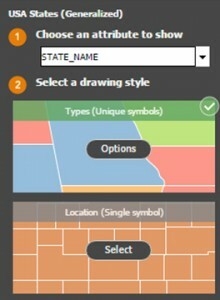 In Illustrator, you can open the M4CC extension (Windows –> Extension –> ArcGIS Maps for Adobe Creative Cloud), and go to the Mapboards tab to define your map area by zooming and panning in/out until you are happy with the map, and then clicking on the mapboard tool to draw your extent over the area you want to map. Since this list of destinations is all in the lower 48 United States, that is where I defined my mapboard. 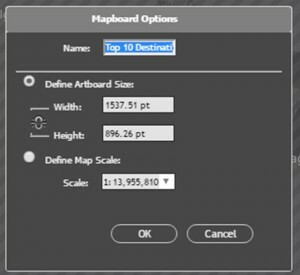 I was prompted to name my mapboard and had options to change the map dimensions and map scale. Note that changing the dimensions and scale can change your map’s extent. If this occurs, you can also manually readjust the extent again. By clicking on the Compilation tab, I added layers that fit the purpose of my map. For my demo at Adobe MAX, I chose the option Overwrite from Map from the Choose and Add Layers button. I selected a web map called “Political Map” which contains country boundaries, US state boundaries, and a few other layers. The image below shows the Choose and Add Layers button as well as the layers that come with this map added to my Compilation. I deleted “World cities,” “World Urban Areas,” and “Ocean Background” from my contents since I didn’t want those layers in the downloaded map. Here is a helpful piece on on adding data to the Compilation window. Now my map and contents looked like this image below (click to enlarge). Since I also needed to add that CSV file from step 1 to this map before I download, I wanted to make the cities in this CSV file easier to see. You can do some pre-styling to your map in this extension before downloading into Illustrator. To add my CSV file from step 1, I used the “Search and Add Content” button. This time I chose “Add Layer from file.” This option will allow you to browse to the location where you have saved .TXT files, .CSV files, and zipped shapefiles to add to your map. Then just select your file and click “Open.” For my list of Top 10 Cities, ArcGIS automatically knew where these large cities are located. The second image below (click to enlarge) illustrates the automatic placement after adding the CSV file to the map. All the cities are the same size point. So I accessed ArcGIS Online’s Smart Mapping tools to symbolize this layer based upon the data. I clicked the Change Style button (painter’s palette) on the new city points layer to bring up the ArcGIS Smart Mapping options for this layer. Since the cities’ sizes should be based upon the magnitude of visitation during Labor Day, the “Rank” column from the Choose an attribute to show dropdown was selected. This indicates that the points will be symbolized by that attribute. The image below (click to enlarge) shows the default graduated symbology that is automatically applied by choosing to symbolize by the “Rank” column. The difference in symbol size between the least visited city and most visited city is not that large. To make it absolutely clear, I chose to increase the difference in these symbols’ size by choosing the Options from Counts and Amounts (Size) in the image above. The options that appear allow for some pretty detailed statistical symbology. Users can choose to add or subtract the amount of class breaks, which will give them more (or fewer) categories by which their data can be symbolized. I left this as the default amount, which was 5. Users can also change the minimum and maximum sizes of their graduated symbology. I kept the minimum at 8 pixels, and increased the maximum to 100 pixels. This extension allows you to add labels to your map. These labels will be downloaded with your map as easily editable text. To label these graduated symbols, I just clicked the Manage Lables button next to the cities’ layer “Top 10.” By default, the “City” column from the CSV file’s data is used to create labels, which is great since that column contains the city names. To make these city labels easily differentiated in my downloaded map, I changed the color of these labels in this Manage Labels window by clicking the color icon. Mappers can choose from many different projections with the M4CC extension. 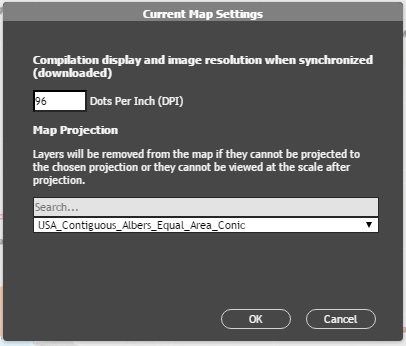 Since my map is over the contiguous United States, I chose the USA Contiguous Albers Equal Area Conic from the map settings options’ Map Projection dropdown. To change the map projection, just click on the Settings button in the top toolbar of the compilation window. Give the extension a moment to reproject your data depending on the amount. Note:If you still have a raster basemap in your contents, it will be removed from your map once you reproject your map. Step 7 – Download and apply your design skills! Notice that the “Top_10″ layer is categorized by the categories that I defined in step 5. This organization can be really useful for design efficiency, especially if you have many symbols to manage. The new Get Started with ArcGIS Maps for Adobe Creative Cloud learn lesson is out! Learn how to download data from ArcGIS and use it in Adobe Illustrator! Edit your map in the Adobe work space to use an advanced suite of design tools.